Young professionals are vital to the moldmaking industry, and it is important to acknowledge those making strides in shaping the industry’s future. MoldMaking Technology recognizes the industry’s young talent through its inaugural 30-Under-30 Honors Program. This year we are happy to announce that Mitchell Fox has been recognized as one of these next-generation moldmakers. Mitchell is a third-generation moldmaker. His grandfather, Al Fox, established Accede Mold & Tool (Accede) in 1981 and his father, Roger Fox, was a moldmaker and is the current owner and president of Accede. Mitchell started his moldmaking apprenticeship at Accede when he was 18 in 2012. 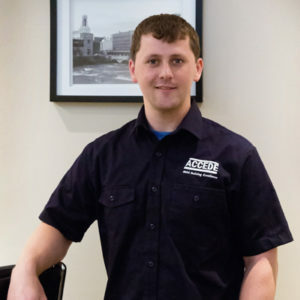 He continued to work as an apprentice while attending college, graduating from Rochester Institute of Technology in 2017 with a degree in mechanical engineering technology. After graduation, Mitchell began to work full time at Accede, continuing his moldmaking apprenticeship. Throughout high school, Mitchell was active with FIRST Robotics as a member of Webster Schroeder/Thomas High School’s team, SPARX 1126. The mission of FIRST is to inspire and encourage students as young as six years old to embrace STEM concepts and careers. Mitchell’s latest endeavor at Accede was building a four-cavity Class 101 pilot mold with multiple side-actions, including hydraulically actuated lift and strip slides and a direct valve-gated hot manifold which sampled successfully in August 2018.